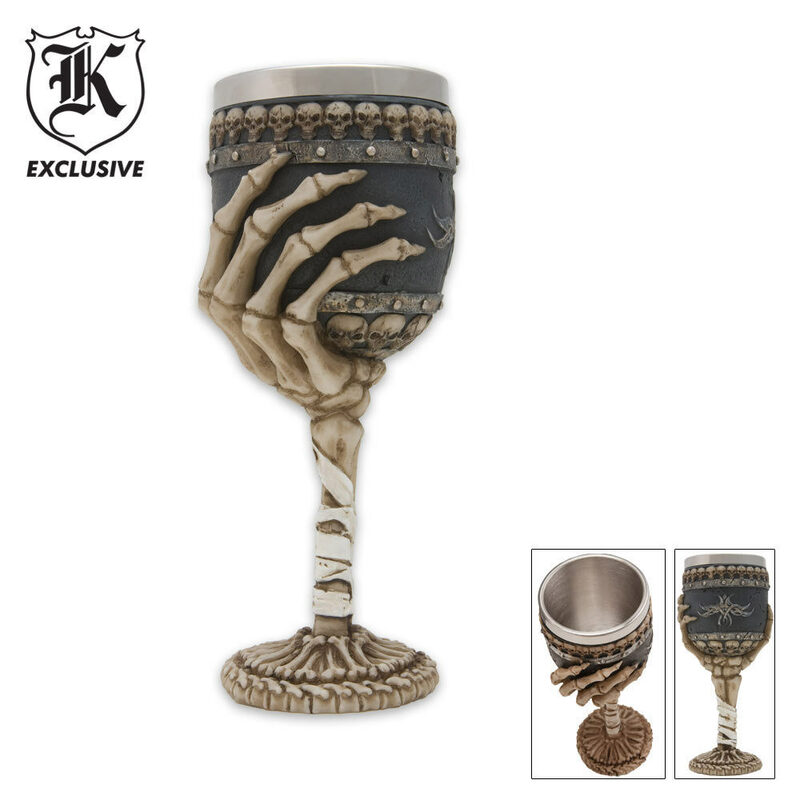 Hand-Bone Wine Goblet | BUDK.com - Knives & Swords At The Lowest Prices! When you drink from this spooky Middle Ages Gothic-style chalice, yours won't be the only hand grasping it. The top of the Hand-Bone Wine Goblet is gripped by the eerie, bony hand of a human skeleton, and chilling tiny skulls line the chalice rim. Assorted arm- and leg-bones comprise the stem and base. The finely detailed, authentic-looking bone ornamentation is forged with tough, break-resistant cold cast resin, and the corrosion-resistant stainless steel inner liner helps keep your drink cool. The Hand-Bone Wine Goblet is loads of fun for Halloween or any time of year and makes an amusing gift. Holds six ounces of your favorite beverage and measures 7 1/2" tall, 3" in diameter. Handle is thick and firm, has great inside thermal cup too. Was expecting cheapo quality gothic knick knack. Instead got a genuine useable and nice Goblet to drink from. This is an awesome goblet! Well made. Great looking. Holds about 1 cup of whatever you drink. All my friends love it. Get one for yourself! Thanks BudK!